Now toss in the social media promises and pitfalls of digital angst (and how fast things can ‘go viral’ to do damage in a blink) and you’ve got full blown alarmist anxiety often driven by industry seeding fear in the usual ‘selling insecurity for profit’ modus operandi. What if we looked at how texting, Facebook and social media could be leveraged by girls, for girls, for good in ‘united we stand’ backtalk? I’ll be doing several posts on using social media as an antidote, to engage, inspire, and uplift in a media world that feels almost insistent on using imagery of ‘mean girls,’ relational aggression and social media as a distribution platform to tear people down. Kicking off this series is author Rachel Simmons of the newly updated Odd Girl Out with helpful back to school social media management tips to delete digital abuse and give context to ‘cyberbullying’(bullycides, abusive online behavior etc) vs cyber drama. 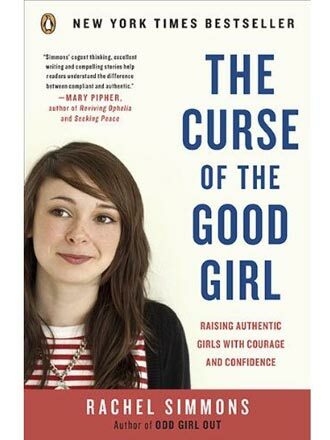 Rachel Simmons is not only a best-selling author with pragmatic, real life tips tweens and teens can relate to directly, she’s also founder of the Girls Leadership Institute, is a Rhodes Scholar, and is author of Curse of the Good Girl. Her site is a treasure trove of solutions-based thinking and youth voices, joining other anti-bullying favorites of mine like A Thin Line.org (MTV’s user-driven peer to peer digital literacy site) and That’s Not Cool (apropos for younger kids too) to help mitigate the damage of digital drama. How can we best put all the anti-bullying ‘businesses’ out of business by NOT “selling abusive conduct” via media in the first place!? How can industry cut off the IV drip of toxic poison when it’s the very lifeline to their ratings and click through rates? From TV fall season line-ups to movie plot lines, cartoons, animated webisodes, and kidlit, the stereotyped depiction of a “frenemie” in the mix is as predictable as the rolling credits. Amy Jussel, Shaping Youth: You note in Odd Girl Out that media now depicts “mean girl” drama on TV at about TEN TIMES the amount of relational aggression existing in real life. With more to “absorb and mimic” then it seems to me media is not just perpetuating, but CREATING problematic behavior by amping up the drama and angst? Your thoughts? 1. Female aggression is funny and entertaining, and therefore a great way to get attention. Attention = celebrity = sense of self-worth and value. 2. Female aggression is an effective way to get what you want. 3. Female aggression is always the best strategy when a desired man is involved. When it is viewed repeatedly in an entertaining format, girls become desensitized to aggression, not unlike what happens when boys blow things up over and over again in a video game. For boys, a video game is a cartoon, so therefore it’s “not real.” For girls, the aggression is “funny” and “extreme,” so therefore “not real.” But both have a very real impact on kids and teens, especially those who don’t have the media literacy tools to analyze what they’re watching. Susan Douglas has written at length in her recent book Enlightened Sexism about the insidious way reality television has presented itself as post-feminist while simultaneously being one of the most anti-feminist games in town. It’s one of my must-reads! Amy Jussel, Shaping Youth: What role can media literacy play to educate the public between “cyberdrama” and cyberbullying? Do you use media clips and current examples in your work to callout digital abuse and drama baiting? Rachel Simmons: I spend a lot of time observing girls on Facebook and talking with them about the challenges posed by social media. The examples I use in my presentations are actual texts, status updates or chats that I have personally witnessed. I also use postings from Formspring, which has surely been the worst offender of the last couple of years. Tumblr is now coming up more often as a platform for cruelty, so I’m using posts from there, too. I’m lucky to have a lot of girls who turn to me when they see things that concern them. My best tips come from the girls. When I first started speaking about “conventional” bullying and aggression between girls, girls were pretty surprised that any adult even knew what was going on. There was no language or attention paid to the behavior. …But I can tell they are also relieved to have a person like me affirm what they all feel inside: this behavior isn’t right, and it should stop. That’s the beginning of change – when something leaves the shadows of personal experience and becomes a collective narrative. Amy Jussel, Shaping Youth: The anti-bullying flag has been waving wildly in the media, with every school bringing in ‘programs’ that range from pragmatic to patently useless bandwagoning for ‘awareness’…How can schools and orgs best sift out the good ones w/benchmarks and criteria? Tips list? Comprehensiveness – Anyone who thinks one speaker or a single day of awareness will change a school culture is kidding themselves. How comprehensive is the desired program? Does it work with all stakeholders, including parents and school staff (besides teachers), or does it just put the onus on kids to change their behavior? Any anti-bullying program worth its salt will work with all parties within the school structure, and invite them to contribute to the initiative. Research & Evaluation– Is there any evaluation of the curriculum or program available? For example, the Olweus program is one of the few anti-bullying programs to be rigorously evaluated, so I feel very comfortable recommending it. Word of Mouth – If you do want to bring in a speaker, how well-regarded is this person? Do some background research and talk to past clients. A speaker can’t change a culture, but they can inspire the first steps. Kids connect to people and their stories. If you don’t have a compelling, authentic, open presenter, it’s tough to connect. You can usually learn pretty fast who’s worth it and who isn’t. The Messenger – Who is delivering the program? If you send a teacher or counselor who is not trusted or by kids to an anti-bullying training, and then expect that person to lead an initiative, it’s doomed from the start. Aside from obvious parenting practices (put the media to sleep too/remove from room) how can kids learn to self-modulate this ‘virtual popularity’ perception, reclaim their rightful roles in their identity quests WITHOUT being tied to what I call the “peers in the pocket” digital drama and relational angst? Rachel Simmons: I have a workshop I teach where I assign girls different forms of social media (AIM, texting, Facebook photo albums) and ask them to come up with everything they love and can’t stand about each one. By naming the feelings of insecurity and anxiety that social media can inspire, girls begin to feel more power over what’s happening online. It’s not just something that lives inside of them – and how many girls, indeed how many people, believe it’s only they who feel or are hurt by something – which means girls begin to feel less alone. By the way, it’s just as important for girls to share why they love social media as it is for them to explore what they don’t like. It also helps to learn strategies to manage the strong feelings that can arise online. If you are aware of your tendency to type your feelings, you can practice calming techniques like walking around the block, petting your dog, or even handing over your phone to a parent or friend. Social media offers the illusion that you can overcome these social anxieties by letting you text with one person while you hang out with another, or rack up lots of friends. The sooner you realize the impossibility of this – which, hey, let’s face it, isn’t easy — the less in thrall (enslaved) you will be to your devices. What ages/stages/gender are adding their voices to the Secret wall? Will you be adding to this social media platform in new ways? Do you use this as a springboard for your Girls Leadership Institute? 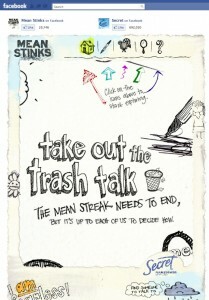 Rachel Simmons: I’m very proud to be serve as a spokeswoman for the Mean Stinks initiative. At this point, teen girls are most involved with our platform on Facebook. They turn to the wall to seek comfort, provide advice, or seek community. In a recent survey, Secret deodorant found that 87% of young women believe that social media can be used for a positive purpose. That’s what I love about Mean Stinks. It’s opening a new channel for anti-bullying initiatives, using one of the places that girls most love (Facebook) for prevention and prosocial conduct. My plan is to continue working with my partner spokeswoman, Amber Riley of Glee, to provide more resources for girls like short videos, Q & A’s, and GirlTips. We’re up to nearly a quarter of a million fans! Amy Jussel, Shaping Youth: What do you view as the primary impact of digital relationships on actual physical relationships between people online/day to day friends? First, friends who hang out together are often texting at the same time. Most girls I know say they feel ignored and even hurt by this behavior, but they don’t feel like they can say anything. I think that’s because texting while hanging out has become a social norm among teens. Which is terrible! The behavior is really rude, and I wish we talked more about how it makes others feels, as well as how to stop it. Second, I think there is an unfair expectation among kids that friendship can be measured in how quickly you respond to someone. 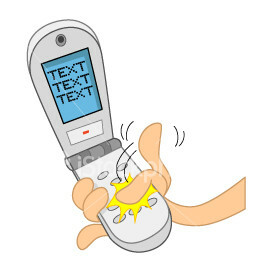 So, if I text you, and you don’t respond RIGHT AWAY, it either means we’re in a fight or you’re not that into me. That’s crazy, but it’s another norm that is evolving. Timing is a very superficial way to measure relationship quality, and it also creates lots of unnecessary drama. As I always say to my students: think about why she hasn’t replied. Maybe she’s busy. Maybe she’s sleeping. Maybe her house is burning down. There are lots of reasons besides you! Amy Jussel, Shaping Youth: “omg” that happens in my house amping up digital drama in a flash. It’s one of the main behavior exhales I most enjoy in our “digital detox” respites. Thank you SO much, Rachel for helping us crawl inside girls’ heads for a bit. 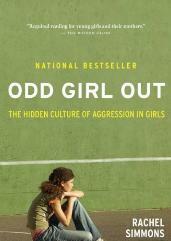 Very insightful and helpful tips in Odd Girl Out, and in this interview. Oblige! Middle School Confidential (graphic novel series and new iPad app, confidence building, bullying prevention; also see Cruel’s Not Cool Facebook adjunct, AnnieFox.com site, and new digital story for 4-8yo, Are You My Friend? which can be found in the iBooks area for iPads/iPhones. This was such a great interview, I’m so happy I found it through Twitter and made time to read it (especially as the mother of two teenage girls). Thanks! Thanks Diana for the kudos and for keeping in touch through Twitter where I seem to be more often than not these days! Love your resources will continue to check them out…Thanks!